Established in 2005 during the infancy of the titanium industry in Thailand, Prolog Titanium, the originator of the Service Center concept for industrial titanium products, has now been serving its customers for more than 5 years. Dedicated to supplying the industrial titanium market segment, we have the capability of providing products from titanium raw mill products, nuts and bolts,part to machine and equipment. 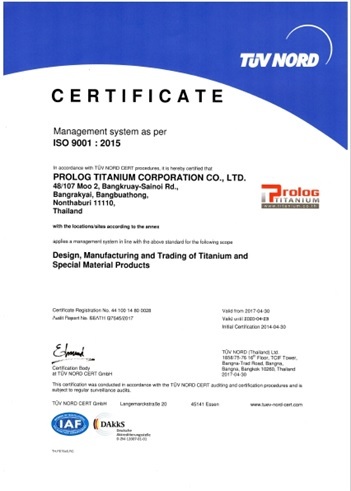 Prolog Titanium is the Thailand's largest supplier, distributor and stockiest of high quality titanium metal products. With its unique combination of strength, light weight, corrosion resistance and other metallurgical properties, titanium is used in hundreds of diverse of aerospace, defense, medical, chemical, electrical, automotive and other Industrial applications where no other metal is as reliable or economical, especially on a lifecycle costing basis. Otherwise we can supply other high performance reactive metal such as Niobium, Molybdenum, Tungsten, Zirconium, and Tantalum which have best properties to resist extremely corrosive, abrasive and ultra high temperature. As a fully-integrated titanium manufacturer and distributor, Prolog Titanium's activities expanded to every phase of titanium field of industry, manufacturing and sales. We convert raw material to manufacturingproducts; and distribute our products globally. We have the financial strength, capacity and technical solutions to meet the established demands for titanium and, as new uses for titanium accelerate, to lead the industry into the future.